Dorothy Elizabeth Schmidt, age 87 of Apple Valley, MN, formerly of Osceola, IA passed away April 23, 2018. Dorothy was born April 26, 1930 in Brooklyn, Iowa and graduated from Leon High School. She married Michael Schmidt on January 3, 1951. For the next 20 years they lived in various places throughout the US as her husband served his country in the US Marine Corps. When Michael retired from the Marines, they moved from Quantico, VA to Prior Lake, MN and together managed the Minneapolis Gun Club for 18 years. Over the years, Dorothy loved to travel, garden, can the vegtables she grew, and crochet. Her favorite color was red so she liked everything red. Everyone enjoyed her beautiful smile and infectious laugh. 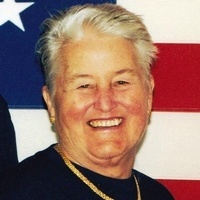 She is preceded in death by her loving husband of 63 years, Michael Schmidt Sr.; daughter, Monica Schmidt; infant daughter, Linda; son-in-law Danny Martin; infant granddaughter, Deborah Martin; parents, Leo and Marie Vogel; brothers Anthony, Joseph, Edward, John, Paul, and Francis Vogel. She is survived by her children, Vicky (Milton) Oliver, Jeff (Britta) Burke, Elizabeth Martin, Mary Kubilus, Michael Schmidt, Jr., Virginia (Stephen) Hines, and Susan Schmidt; 11 grandchildren; 8 great-grandchildren; brothers, James, Bernard and Donald Vogel; sister Anna Meador; special friend Anita Opfer; nieces, nephews, and other relatives and many friends. Mass of Christian Burial will be held 11AM Monday, April 30, 2018 at All Saints Catholic Church, 19795 Holyoke Ave., Lakeville, MN with visitation on Sunday from 5-7 PM at the White Funeral Home, 20134 Kenwood Tr. (Co. Rd. 50) Lakeville, MN, also 1 hr. prior to Mass at Church. Interment, Iowa Veterans Cemetery, Van Meter, IA. Special thank you to all of the care givers at Ecumen Seasons of Apple Valley and St. Croix Hospice that loved her so dearly and cared for her the past few years. Visitation on Sunday from 5-7 PM at the White Funeral Home, 20134 Kenwood Tr. (Co. Rd. 50) Lakeville, MN, also 1 hr. prior to Mass at Church.